This year’s theme for The International is all about the ocean: there are aquatic cosmetics and a campaign about a sea-dwelling monster called Siltbreaker. But this year’s special map, Reef’s Edge, caused a stir in the Dota 2 community during TI7's kickoff. As the group stage matches commenced yesterday, it became clear that all games were being played using the Reef’s Edge map. While all Dota is played on one map, cosmetics can alter the appearance of it—like adding different graphics to a basketball court. The issue with Reef’s Edge is that it has some noticeable readability issues. The river isn’t really “the river” anymore, but a trench. Fish, land mines, and shipwrecks sometimes hover in front of the camera. Most notably, the spider hero Broodmother’s webs are difficult to see, thanks to the sea floor effect on the ground. 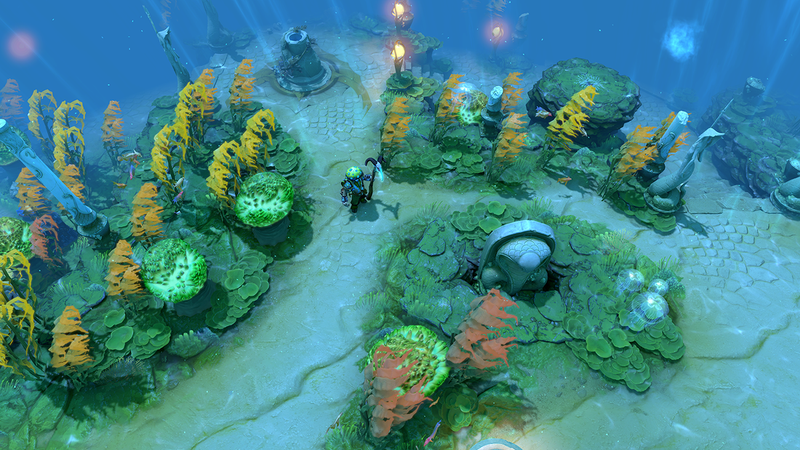 While this wouldn’t affect the players in the game, as they’re able to use their own map cosmetics, or viewers in the Dota 2 client, Twitch spectators were stuck with the underwater map. From Team Liquid’s game against EG, where Matumbaman played Broodmother mid. He’s standing on a web. It isn’t the first time a new map has created spectator issues—the Immortal Gardens terrain, a personal favorite of mine, replaced some trees with fountains, making it strange when heroes would use tangos to eat them. To Valve’s credit, they were quick to respond. This morning, Russian observer CaptainSashko tweeted that all games would be broadcast on the default Dota 2 map from here on out, and if you tune into the main stream, you can see that vanilla terrain for yourself right now. To put some skin in the game, I enjoyed the ocean terrain. It’s a nice change of pace, and adds a little character to this year’s International. Having a “theme” for each year’s TI can help it stand out a little, and a slight update to Broodmother’s webs, possibly adding a tinge of luminescence or a stark outline to the edges could solve the cosmetic’s biggest problem. The sunken terrain was among several issues with day one’s production, from underused panel talent and dead air (also fixed today) to in-game spectator challenges not working, and it was likely the easiest fix. At the end of the day, readability is key to both comprehending and enjoying the action—otherwise, it might as well be a Punjabi Prison wrestling match.